MINNEAPOLIS —Start a conversation with union members about hunting or fishing and you’re going to learn a lot. You learn about a tradition of hunting and fishing passed on from generation to generation. You learn about the trophy elk — and also about the missed shot. You learn that just simply spending time in the outdoors with family and friends is the best part of the experience. You learn that union job makes it all possible. Here are the stories of three union members sharing their hunting and fishing lives with Labor Review readers. 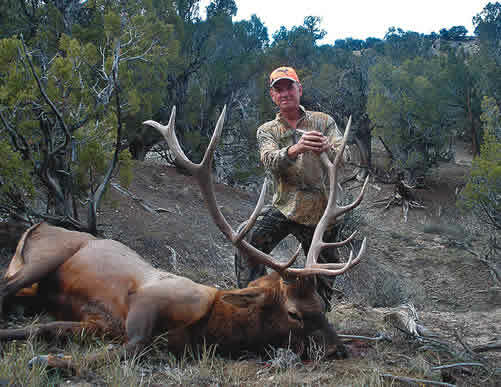 Plumbers Local 15 member Mark Burch shot this elk in fall 2013 near Rock Springs, Wyoming. “I was on government land we all own and we all have a part of,” he said. On a recent summer evening, Plumbers Local 15 member Mark Burch sat at a table outside a suburban Minneapolis coffeeshop telling a tale about a maybe once-in-a-lifetime elk hunt in the high mountain desert of far-away Wyoming. Two days later, winter came early to the high mountain desert with a major snowstorm. “Had I waited another day or two, that whole herd might have been gone,” Burch said. Nearly two years later, “I think we still have a little bit of sausage in the freezer,” Burch said. Burch, 55, has been a member of the Building Trades since he was age 17. For the past 30 years, he’s been a member of Plumbers Local 15. “I’m a plumber but for years I’ve been a foreman and superintendent,” he said, including working as one of the field supervisors at the new Minnesota Twins stadium. Burch continued his work for Metropolitan Mechanical Contractors during his cancer treatment and, thanks to his union health insurance, had “unbelievably good coverage” that allowed him choices in his medical care. Mark Burch’s father, Richard Burch, is a former business agent and business manager of Plumbers Local 15. The elder Burch took Mark and his brothers hunting and fishing as they grew up in Brooklyn Center. Mark and Cindy Burch live in New Hope. The couple — who grew up five blocks apart and attended grade school together —have three adult children and one nine-year-old grandson. Last year, Burch took his grandson goose hunting in South Dakota. “He was the retriever,” Burch joked. Another union building trades member who grew up in a hunting family — and is passing on that tradition to the next generation — is Pete Lindahl, business manager of International Brotherhood of Electrical Workers Local 292. He proudly shared stories about son Jack shooting his first buck and first wild pheasant. Lindahl, 50, grew up in Minneapolis and attended Dunwoody Institute before joining IBEW as an apprentice in 1987. He served as a Local 292 business representative from 2009-2014 and as financial secretary from 2011-2014. In 2014, he was elected business manager. His late father, Robert Lindahl, was a 30-plus year member of the Carpenters union and a union general contractor. “Most of my family were union members,” Pete Lindahl reported. Lindahl lives in Shakopee with his wife Stacey, teen son Jack and teen daughter Lauren. He has access to hunting land nearby in Lakeville and a little further away near New Prague. “If all of a sudden I have a Saturday open… off we go,” Lindahl said. Lindahl’s son Jack, then age 14, shot his first buck there — a 10-pointer. “You try to set things up so he gets a chance — it doesn’t always work out that way,” Lindahl said. Last fall, at age 15, Jack shot his first wild pheasant. “The opportunity came and he had a chance and he shot well and he got that bird,” Lindahl said. Lindahl said he goes pheasant hunting more now than in years past, with the help of Junie, a seven-year-old Large Munsterlander. “The dog is one of the best things that has happened to us in terms of hunting,” he said. 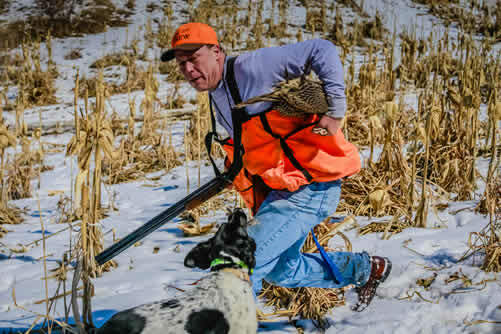 “I don’t need to say a word to this dog — I use a whistle a little bit… She knows what she’s doing and she knows what I’m doing… She’ll run out, make sure she knows where I am,” Lindahl said, so the two are hunting as a team. “I trained her myself with the help of a breeder,” Lindahl said. Since Junie was 10 months old, she’s joined Lindahl in competing for the past six years in the U.S. Open Pheasant Tournament at the Minnesota Horse and Hunt Club in Prior Lake. “The best I’ve done is sixth place in the Top Gun Pro Puppy Pointer,” Lindahl said. “You’re competing with the professionals,” he noted. “Union labor has provided me and my family with access to firearms, gas to drive where you need to go, lodging, things that otherwise those without a living wage wouldn’t be able to afford,” Lindahl added. For Corey Webster, “union is kind of in the blood.” Webster, Crystal, is a 15-year member of City Employees Local 363 and currently serves as the local’s vice president. He works for the City of Minneapolis Solid Waste and Recycling Department, where he also is union steward. His two brothers work for the airlines in union jobs and his father, the late John Webster, was a Teamsters union representative. For Webster, another passion is fishing. “I like to fish for walleye,” Webster said. “I go to Baudette, Minnesota for every opener. “I like fishing Lake of the Woods on the Minnesota side and the Canadian side and I like fishing the Rainy River,” he said. Part of the fun of fishing is the company — and banter — with friends, Webster said. “We joust with each other all the time.” One year, he joked with his buddies, he would bring a secret weapon. He showed up with a Ron Popeil “Pocket Fisherman” — and caught a 24-inch walleye. 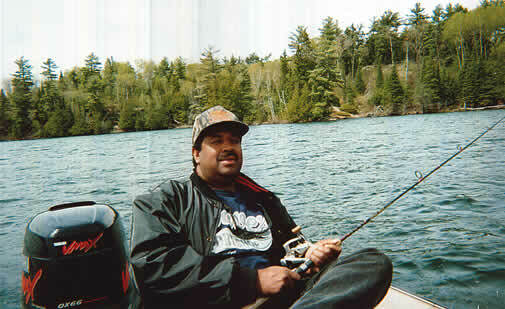 Some of his fishing buddies are fellow union members, including postal worker Jeffrey Johnson and Minneapolis firefighter Richard Robinson. Webster is divorced and has a son, 21, and a daughter, 18, but they’re not much interested in fishing, he shared.